Best experience had in Japan: Enjoyed trying all of the wonderful food. I had a wonderful time in Japan, and on the tour, I have so many wonderful memories that I am taking back home. The next time I come back to Japan. 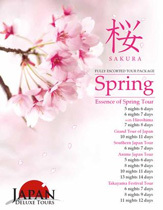 I will use Japan Deluxe Tours again. We stayed in both modern and traditional hotels. I loved trying the traditional foods. Hiro explained everything so well. Thank you so much for showing us Japan!!! We saw a wide variety of modern and traditional sites.